Is there a better alternative to adminGtool Basic? Is adminGtool Basic really the best app in Inventory category? Will adminGtool Basic work good on macOS 10.13.4? 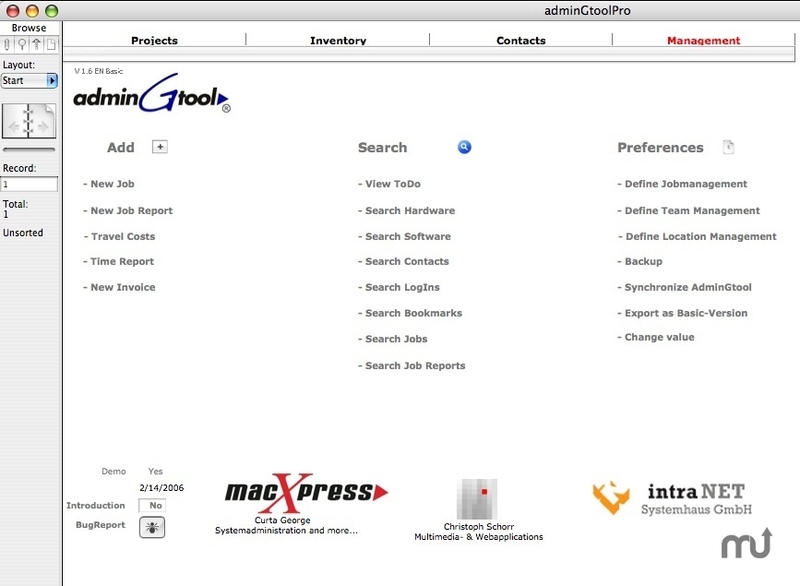 adminGtool Basic needs a review. Be the first to review this app and get the discussion started! adminGtool Basic needs a rating. Be the first to rate this app and get the discussion started! Downloading adminGtool Basic will give you a assistant which optimizes the cooperation of companies and external IT-service providers by using a shared, current database. Within a company, the assistant can be used to give IT-managers an exact overview of the existing hard- and software structure and to make a thorough controlling possible (e.g. work time, travel times, costs). Investments as well as maintenance costs can be identified for every individual workstation, reports give information about the economic efficiency of the IT- inventory and thus allow for a better planning of future investments.Tracing occurring problems and managing dates (e.g. write-off dates, licence expiries, due updates or ends of contracts) will lower costs and immediately increase IT- transparency.Passwords and configurations are among a company´s most sensible data. With adminGtool Basic, these data are safely stored and can be accessed at any time by authorized persons. Dependencies on individuals or contractors are thus eliminated. adminGtool Basic contains standard print templates. The main use of these templates lies of course in the areas of documentation and billing. Yet there also is a second purpose to them: Using these templates will create a consistent vocabulary which at the same time exactly defines services to be provided. They are a guideline for external or internal technicians in writing work reports or invoices. Here, workflows are defined which turn best practices into working standard and strictly define tasks. IT-downtimes are thus minimized and the company profits of increased productivity. Via Filemaker interface, data can be ex- and imported and stored as tab-separated text, comma-separated text, SYLK, DBF, HTML, Table XML or other formats. Its clear design which is strongly focused on main functions and the generic, conditional value list make adminGtool Basic an easy-to-maintain application which can be used without very specialized skills.